Do you consider buying a used LG cell phone? Read this article and find out everything about an LG phone in the world in an instant. LG mobiles didn’t make a huge impact on smartphone market but they still remain a solid mid-range cell phone option. There are many refurbished cell phone to choose from but when you are on a low budget, Android phones like LG G6 remains a solid option. Like any other used smartphone or iPhone, a second handed LG mobile will be most probably SIM Locked to a Wireless Network. If you search online for LG phones, you will find great deals but most of them are carrier locked indeed. But is SIM Lock their only problem? Are you sure they are not stolen? A stolen LG phone will be blacklisted, Google Locked or both? Are you sure about description’s specs? Is this LG cell phone eligible for Network Unlocking? Even if you choose a local retailer or buy it through a personal transaction, can you simply trust the seller? 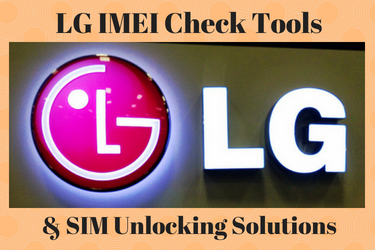 Like any other Full IMEI Check Service, it works exactly the same for all LG smartphones and any Wireless Network. Solid IMEI Check Companies like UnlockSpector have authorized access to LG’s and Mobile Networks’ Databases where all mobile device’s details are stored through the IMEI number. As soon as you get your LG IMEI Check Report you will have a clear image of the LG you are interested in, as well as what it takes to unlock it. Is this LG phone SIM Locked or not? If an LG cell phone is reported as lost, stolen or replaced, has unpaid contract bills by the previous owner or was involved in fraudulent activities then it will be blacklisted. You can use any SIM card with a blacklisted phone inside the country it was blacklisted and probably in other countries too. The only way to make this LG CLEAN again is to eradicate the blacklisted reason. Find out if an LG device remains under contract with the previous owner and the monthly tariff remains at good standing. Don’t forget that if the previous owner stops paying his bills your LG phone will become blacklisted even if when you bought it was ok. If an LG smartphone remains protected by Warranty or Insurance Plan with the previous owner, he has the right to report it as lost or stolen or ask for a replacement and this means that the LG phone you bought will get blacklisted. When an LG phone is replaced, the IMEI number (and sometimes serial) is eventually changed to a new one. There is a shady LG Unlocking Method based on this aspect but in the end that phone is detected, flagged as replaced and of course, it gets inside the national blacklist. You want to know if the IMEI number you are looking at is the original one. Right now, you can tell everything about an LG smartphone BEFORE you buy it. If everything is proven to be alright, you can buy it without second thoughts. On the other hand, even if it is SIM Locked or has other issues, you know exactly which they are and how to deal with them. What about Free LG IMEI Check Tools? You can find many free IMEI Check Services but unfortunately, none of them works simply because they don’t have true access to IMEI Databases and instead they provide you with false info. To tell you the truth, I never understood why these Free LG IMEI Check tools exist but avoid using one of them. Did you find this post useful? Which IMEI Check Service did you use? Are you satisfied with their services? Leave a comment below and tell us all about it. Until next time, take care!